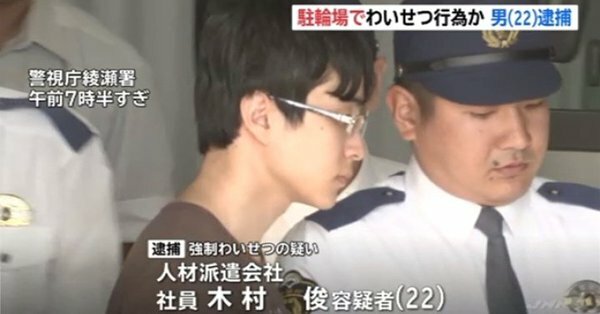 TOKYO (TR) – Tokyo Metropolitan Police have arrested a 22-year-old man over the alleged molestation of a high school girl in Adachi Ward earlier this year, reports TBS News (Oct. 10). At just past 10:30 p.m. on June 29, Shun Kimura came up from behind the girl and grabbed her arm as she commuted home through a bicycle parking lot near the residence of the suspect. He then allegedly fondled her chest and lower body. After the girl screamed for help, the suspect fled the scene, according to police. Kimura, who has been accused of indecent assault, admits to the allegations. “I was searching for a girl of my liking who rides a bicycle,” the suspect was quoted by police. Kimura became a person of interest for police after an examination of security camera footage taken in the area.